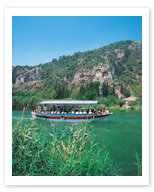 Dalyan is still a peaceful riverside town known for its oranges, cotton, and wheat, despite its growing popularity. It is a charming and attractive place to spend some time in, with an pleasing boardwalk, a lazy river meandering its way through, and a simple rustic Turkish atmosphere. The beach is quite popular, though primarily for visitors of a very special sort- Dalyan is home to one of the most important nesting sites of the endangered loggerhead turtle, whose unspoiled habitat here is being vigorously defended.